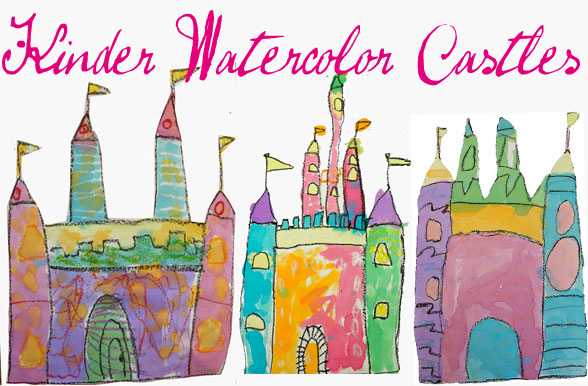 My Kinder students joined in on the fairy tale fun by learning how to turn lines and shapes into a watercolor castle. By combining squares, rectangles, triangle and a few half circles, Kinders created their very own castle. You don’t need many supplies; a 12″ x 18″ piece of regular drawing paper, some liquid watercolors and some oil pastels. I like to start the drawing with a simple line. Children select their favorite color and draw a line across the bottom of the paper, being careful not to touch either side. Then, they draw two long lines up each side. The drawing at this point looks like a square with 3 sides. Now, they complete the two towers by drawing a short line across the top of each tower and then all the way down to the first line. This may sound complicated, but it isn’t. The towers are basically two rectangles. To make the face of the castle, connect the two towers with one simple line. Above the line, children draw battlements. Place two triangles on top of the towers and the drawing is really taking shape. 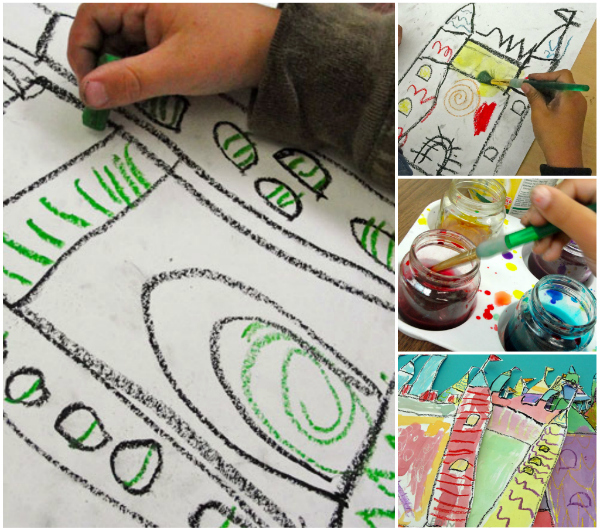 After adding embellishments such as flags, a doorway and windows, children use their colored oil pastels to draw bricks or patterns. The final step is to paint over all the shapes with liquid watercolor. If you have liquid watercolor, use it here. It really helps having the pre-mix colors as pan watercolors would take slightly longer to apply. I opted to cut out the castles with the students so we could make a bulletin board display, but if you don’t like that idea, continue drawing a simple background (add a horizon line at least) and paint. Looking for more castle projects? Click the image below to receive our free PDF lesson guide! Oooo, I love this one! Hope you don’t mind, but I put it on Pinterest in my homeschool file. And, of course, I linked it back to your post. Don’t mind you pinning at all! LOVE Pinterest! I would like to know what kind of watercolor you use. I live in Québec and the name watercolor dosn’t mean the same I guess…watercolor here comes in little tubes and his expensive…is it a kind of ink that you use? Does it stain fingers and clothes? Hi Danyelle….children’s watercolor paint palettes are available in any craft or art store (even in Quebec!) but click on the link and you’ll be directed to a link where I buy mine. We did a similar project for our space theme. We used shapes to draw the rockets then used a colour wash before outlining in black again to make the colour pop! They now fly through the universe we created on the wall around the hand print sun, around the marbelled planets we made. I’m not sure who had more fun doing this projec,t the children or me!! Oooh! This sounds like a great project! Did your kids have a hard time cutting out around their skinny flags etc? that’s where I always run into a problem when my K’s cut stuff out. Yes. It’s hard for this age to cut around small areas like flagpoles. A parent helped with that. Honestly, I wouldn’t suggest cutting these castles out. We did it for a specific display. I have very fond colored drawings. This technique is suitable for pupils of younger school age. Wax pastel watercolor prevent leakage. What you illustrate a fairy tale? I love how you are using baby food jars for the liquid watercolors. Easy to store, harder to tip! I pinned it. Thanks so much for sharing your wonderful lesson plans. I have used many in the past two years and all were successful. I waited about 3 months before I got enough bottles from parents to have enough to put on all my tables. Sometimes the lids are hard to remove because there is so much suction, but they are the BEST storage for liquid watercolors. Highly recommend these free beauties! Did you show them any prints or reference photos first or did they just model off of your example? Yes, I have lots of castle pictures and we spoke about all the points on a castle…but not in too much detail. The class is short and the focus of this lesson was shapes and stamping, not drawing skills. They did a great job and had tons of fun with the creative paper details. I am so jealous that your kids get art instruction. Our school district is all about math and reading. No time/budget for artistic endeavors… I have to pay for an after-school class for my kids to do art. In the meantime, I LOVE reading your blog and getting ideas for me to do with them independently. I always love what your kids create! Believe me, our program is tiny! But even tiny can sometimes be enough. Fight for art…that’s what I did. Took me 8 years! I love this idea! I have a question. 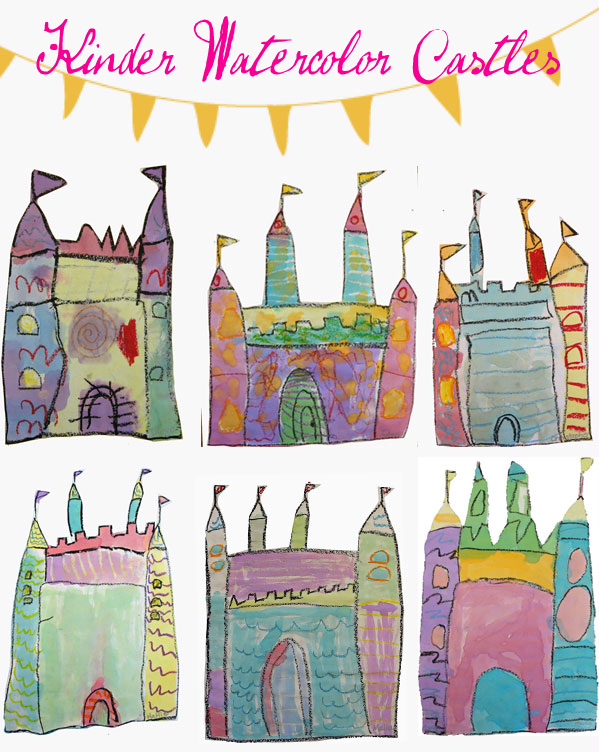 What did the children use to draw the castle in the beginning, before the oil pastels and watercolors? Was it crayons? Thank you! How badly did they smear? I ask because everyone has different tolerant levels for smearing. Did the children mind? What kind of oil pastels are you using? The cheaper the brand, the fewer smears. More expensive, high-quality oil pastels may contain more oil and thus be better for blending, etc. Hi, this looks like a fun lesson! Especially as I work in a girl’s school. I like to start my art lessons with a picture book. I’m planning a combined lesson for Pre Kindergarten – Year 2 students – do you have any books in mind that would work really well with this project? You could read many books relating to castles…the paper bag princess, Princess and the Pea…not sure. Anyone else? I love this project. I found it on your website 4 years ago when my son was in kindergarten, and I was so glad to find it again. I’ll be teaching it to my daughter’s class this week. We used gold embellishments as a final touch last time I taught it. It’s a good amount of step by step directions, not too much for kindergarten. Thanks! I love this one, too. And it’s always better with a bit of gold!